if you follow me on twitter you might have noticed that I’ve been talking about #jewelleryfieldtrip a fair bit. I’ve been going to a few jewellery events and since hashtags are so in right now (you know me, always down with cool kids), I thought I’d call my little adventures #jewelleryfieldtrip. To my fellow jewellers I thought you might be interested to hear what I thought of the event and who I really liked. To my other readers, especially those based near me, I thought you might not know about the event, and I don’t want anybody missing out! The logical conclusion was, why not write a recommendation if I enjoyed an event very much. So yesterday evening I went to Handmade in Britain 17, the Chelsea edition. I’ve been interested in the Handmade events for a while and have heard good things about them. Unfortunately I couldn’t make it to Handmade Kew, so I was keen to go to Chelsea. My plan is to apply for more shows in 2018 and I wanted to see if this one would be a good fit for me. The ‘line up’ of super talented crafts people also meant that it was definitely worth a visit. After I finished my oh so dreaded tax return yesterday, I got all dolled up with my new favourite pair of earrings and made my way across town to Chelsea. Chelsea is such a beautiful and bustling area. The Saatchi Gallery is just around the corner from Chelsea Town Hall which immediately gives you this arty feeling. Chelsea Town Hall is an incredible place to have a craft show, the ceiling of the hall is super impressive and beautiful, but I tried not to be too distracted by it and get on with exploring some amazing craft. My first stop was at stall 4 where I met the lovely Sabine König. A fellow german jewellery designer who makes very beautiful, bold and striking jewellery in sterling silver and 18ct gold. I have to admit my absolute favourite piece of hers was this beautiful pearl necklace which has a very cheeky twist to it. From the front it looks like a normal pearl necklace, but imagine when you wear that stunning evening gown with an open back (that’s hidden in all our wardrobes somewhere) and you can see the true beauty of this necklace. Not only was Sabine very nice, she also invited me to two exhbitions she’s involved in: Precious Kent – Objects of Desire showing in Margate 1st – 3rd December at the Pie Factory, and Designer Jewellers Group at 67 York Street in Marylebone, London, which I will definitely be going to. If anybody fancies coming with me, please do get in touch. It’s always more fun to go together! I continued my #jewelleryfieldtrip exploring more beautiful hand made crafts. I came across a lot of great jewellery designers and I’d love to write about them all, but then this blog would be incredibly long! Jo Irvine‘s jewellery really caught my eye, her clear forms and beautiful lines have a minimalist style. I love two tone jewellery and I think we are both picking up a trend here, two tone jewellery is totally ‘en vogue’ this fall/winter. Silversmith and Jeweller Victoria Radcliffe is exhibiting some super cute little climbers which I’d love to have as earrings, but her ‘natural rock ice cubes’ were just amazing. A must have for every whiskey connoisseur, these clever little rocks keep your spirits cold but don’t dilute them with water. They are just absolutely brilliant! 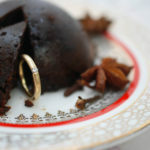 Check out her website for some more awesome silverware. And look at this! On her instagram I found another exhibition I need to make a #jewelleryfieldtrip to! You might think this exhibition is only full of jewellers, but I saw some other amazing crafts too. In my time at university I always loved to work in the ceramics workshop, as some of you might know, so I’m always drawn to some beautiful ceramics. The little bud vases you can see in the image below caught my eye immediately. 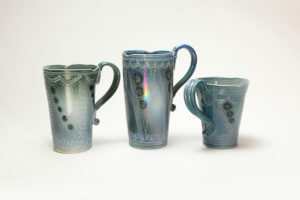 These beauties are handcrafted by the super talented Olivia McGill and exhibited by Brian from Craft Editions. Craft Editions is a curated platform for handmade pieces from the UK, Ireland and South Africa. They are perfect on top of a sideboard with or without flowers in them. I think they’re so nice, they work by themselves as well. These gorgeous little Gold Leaf Bud Vases by @oliviamcgill are perfect for the festive season! Another non-jeweller’s work that I liked was Margaret Gardiner, who also works in Ceramics. Her creations have the most beautiful textures and glazes. She told me the secret to the shine on the glaze, but I’m not sure I’m allowed to tell you. I’m sure when you go and visit Handmade Chelsea this weekend you can talk to her as well and she’ll explain it to you too. Last but not least I would like to mention the gorgeous handcrafted fabrics from ARRA Textiles. Inspired by the ever changing seascapes and coastlines in Scotland, each piece is handwoven in their Studio in Kincardine O’Neil. The throws on display have a soft touch to them and the patterns of the textiles are so beautiful. This #jewelleryfieldtrip was such a great day out. 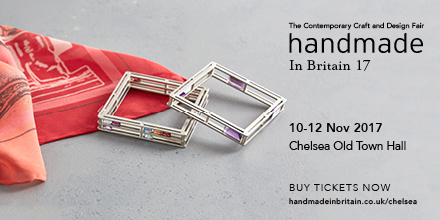 Handmade in Britain 17 in Chelsea is really awesome and worth exploring. I met some great people, saw amazing jewellery and discovered lots of other crafty pieces I would love to buy too. To my jeweller friends, all the exhibitors had great things to say and highly recommended applying next year, and I definitely will. The quaity of the work shown was very high and it would be an honour if I was selected next year. To my other readers, definitely make your way down to Chelsea this weekend. You can see some brilliant work and maybe even start some early Christmas shopping! That’s it from me. Enjoy your weekend!